Deckorators® Frontier is made with the same patented Eovations™ technology as Deckorators Vault, it has the industry's best strength-to-weight ratio. Not only is it powerful, stable and won't absorb moisture, but the durable polymer cap stock won't stain or fade. The Eovations technology inside Frontier allows the decking to be lightweight and creates a fiber-like structure inside, similar to wood, giving it unmatched strength. The lightweight boards are easy-to-handle on the job site and have similar properties to PVC; however, unlike PVC and other composites, Frontier won't splinter, sag, chalk or crack. Overall, deck installation and maintenance are improved with this brand new premium deck board. 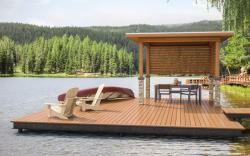 Looking for prices on Deckorators Frontier Composite Decking Materials? We can help! Fill out the form below and we will calculate how much you need, then give you a price. If we have additional questions, we will email or call you.